In partnership with The London Metropolitan Archives and Museum of London Archaeology, we are able to offer a range of exciting workshops to community groups. Workshops offered through the project team teach community groups how to use the Layers of London website, and how to develop meaningful, accurate and informative records that capture their stories and identities in an interesting and accessible manner. We can also support groups develop the skills to record oral histories and digitise historic collections. Workshops offered through the Museum of London Archaeology focus on teaching community groups to understand specific historic buildings of interest to them, and to develop the skills to understand how these buildings have changed over time. They focus on the historic environment by looking at buildings and places. 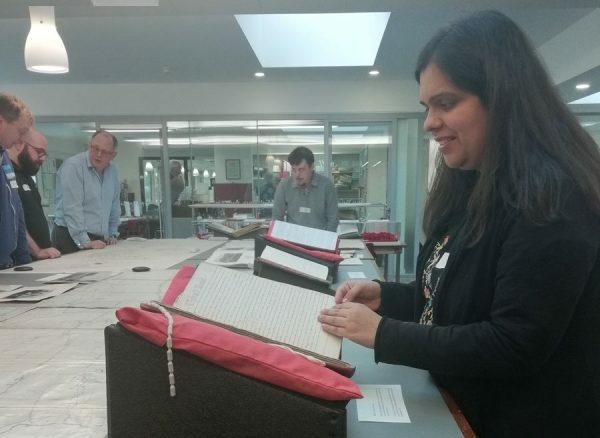 Workshops offered through the London Metropolitan Archives focus on projects to enable community groups to research their history and identities, and to develop material to share with a wider public. They focus on community identity and historical research. If you are part of a group or plan to establish a group to record any aspect of London's history and heritage and feel that you would benefit from our support, please get in touch. Learning about historic documents and how they can be used to develop history projects. (Valence House Museum, Barking and Dagenham).